Digital Media presence has become essential for football clubs in terms of growing their brand footprint on the global stage, and some South African clubs are demonstrating a great understanding of the power of social media in connecting with their own fans, but most importantly reaching new audiences. Kaizer Chiefs have been struggling to win some silverware of late. However, there is some consolation for the club following the research results into the digital reach of football clubs published by a German-based digital sports media platform Result Sports. 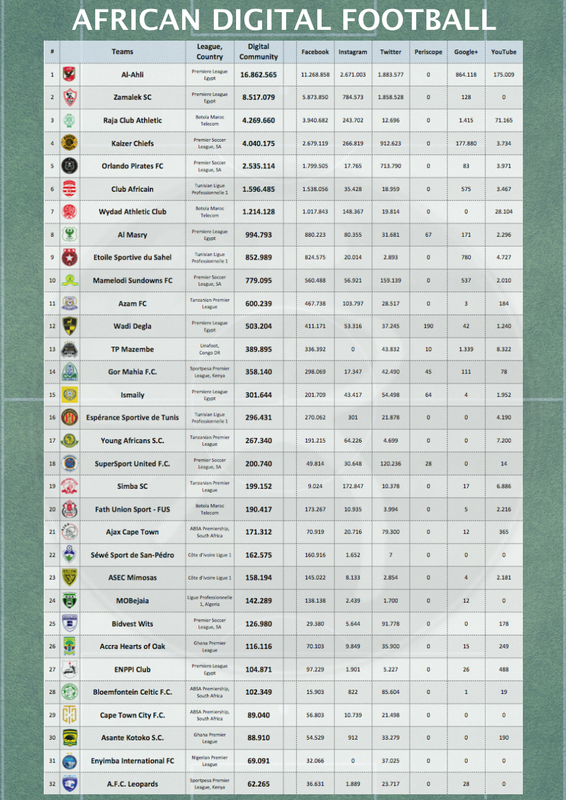 The findings make for interesting reading into the clubs’ reach across all their digital platforms, with a clear breakdown of followers on each channel that the teams are utilising. Generally speaking, many would expect football clubs at the lower end of the footballing hierarchy to be struggling with their digital reach. However, it is impressive that clubs like Cape Town City and Bidvest Wits – with their period of existence and number of fans – can have as high a reach on digital media as they do. Kaizer Chiefs, whose marketing strategies are undoubtedly high up there with the best of the best football clubs in the globe are ranked fourth in Africa, behind North African giants Al Ahly, Zamalek and Raja Casablanca. Amakhosi’s marketing team, led by Jessica Motaung, deserve a standing ovation though, for the club’s astounding 54th position globally, which sees them above notable well-known global clubs like West Ham, Fiorentina, Aston Villa and LA Galaxy, who shot to fame after signing David Bechkam from Real Madrid. Orlando Pirates have set a good precedent and provided inspiration for South African clubs to compete in continental club championships as reigning CAF Champions League champions, Mamelodi Sundowns coach Pitso Mosimane has often said. Their continental exploits have put their name high up there. The Bucs are ranked just below their arch-rivals Chiefs on position No 5 on the continent and 75th on the global standings. Sundowns, who are the defending champions of Africa’s premium club championships, have also made their mark on the continent, winning a few new admirers as demonstrated by a recent video of a young boy from East Africa who made a video dedicated to his idol Percy Tau. The Brazilians find themselves in 10th position on the African club rankings, with their cross-town rivals SuperSport United, who have had a great run in this year’s CAF Confederation Cup, firmly ranked 18th on the continent. Cape Town City’s story shows that the power of social media is massive, even if you are a new kid on the block. Creating a buzz around your brand by keeping your fans informed and engaged, coupled with good performance on the pitch, is rewarding. City have mesmerised fans with their witty and very creative approach to their use of digital media, and that has earned them an awesome ranking of 29th in the continent, two places above former African champions Enyimba of Nigeria. Ajax Cape Town are ranked 21, Bloemfontein Celtic are on number 28 while Premier Soccer League champions Bidvest Wits, who have an impressive digital media strategy, are at number 23 on the continent.